Voters are cynical and disillusioned of the political process. Two in three Americans say they would fire the entire Congress if they could. How do we restore faith in our congressional institution? One way is to make our Congress more representative of the people. Another is to give the voters more choice at the ballot box. America has one of the lowest voter turnouts in the world. Two recent studies show that term limits can make our elections more meaningful. More voters go to the polls when there are more meaningful choices. Most incumbents run unopposed. How may the Constitution be amended? Both the federal government and the state legislatures have equal power to propose amendments. However, only the states may ratify amendments. Our goal is to get the states to use their constitutional power to impose term limits on Congress using Article V of the Constitution. Despite being one half of the population, women make up about one-quarter of the state legislators. Why are political bodies not representative of the makeup of the citizenry? According research by Samantha Pettey, Assistant Professor of Political Science at the Massachusetts College of Liberal Arts. Women do not sense there is an opportunity because the power of incumbency is so strong and there are barriers to entry. Women feel deterred when going up against powerful, career insiders and they don’t have a chance to win. With term limits there is about a 40% increase in women running for office. Nearly 40% of all elections were uncontested. Maine was the worst state this cycle with more than 83% of the elections having no real choices. Poster child for term limits, Grassley, was elected 59 years ago. Senator Grassley has never won an election with less than 65% of the vote as an incumbent. He refuses to sign the term limits pledge or to cosponsor the term limits amendment resolution in Congress. It’s no wonder Sen. Grassley has earned an “F” grade on the USTL Legislator Report Card. Term limits enhance the ability of women to serve and return back to society to their responsibilities. U.S. Term Limits and Remington Research Group 69% support tighter term limits, only 18% Opposed. We drilled deeper than that. We asked if making Arkansas term limits the very strictest in the nation would affect your vote. 55% said they would be MORE LIKELY to vote to support the amendment. Arkansas has been rife with corruption so Arkansans are ready to vote in favor of stricter term limits. The citizens of Arlington finally said “enough is enough” we want change in this community. They garnered 11,433 signatures to put a term limits initiative on the ballot. 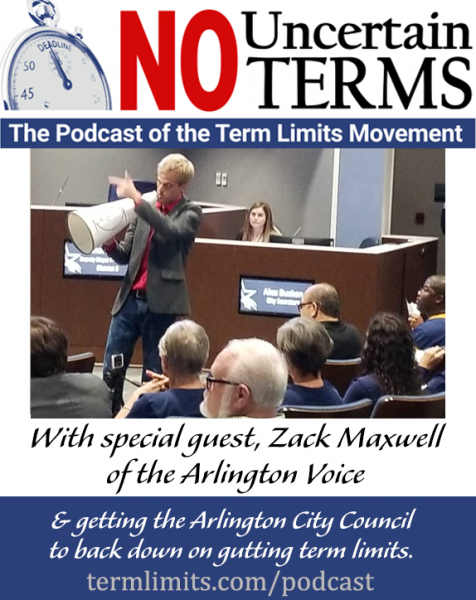 Maxwell mobilized a movement of citizen groups who were continuously getting crushed by the city council and accomplished the ballot signature drive in 10 weeks. The Mayor paid agitator goons to derail the volunteers and citizens signing the petition. Once it was clear the measure would be on the ballot, the City Council rushed a watered down version of term limits to compete with the citizens’ initiative. Maxwell’s team won a restraining order because the council short-circuited the legal protocols to place their measure on the ballot. The City Council scheduled a rare meeting at 7pm on a Sunday to vote to suspend the rules of the city in order to skirt the restraining order and put their weaker term limits on the ballot the day of the deadline. Maxwell’s team went full force demanding resignations of the council members and the Mayor. After two hours of citizen castigation, the council accepted defeat and killed its own bill. It was a midnight hour move with all the fire power save the pitchforks and torches. Politicians win when the citizens roll over. Bravo residents of Arlington, Texas for standing up against a tyrannical government.